Aurifil Designer of the Month for November is ME! Aurifil has a Block of the Month every year that starts in January and has free blocks every month for you to print up and make. Pat Sloan coordinates the event every year with twelve industry designers and a theme. This year the theme is "Blue and White." 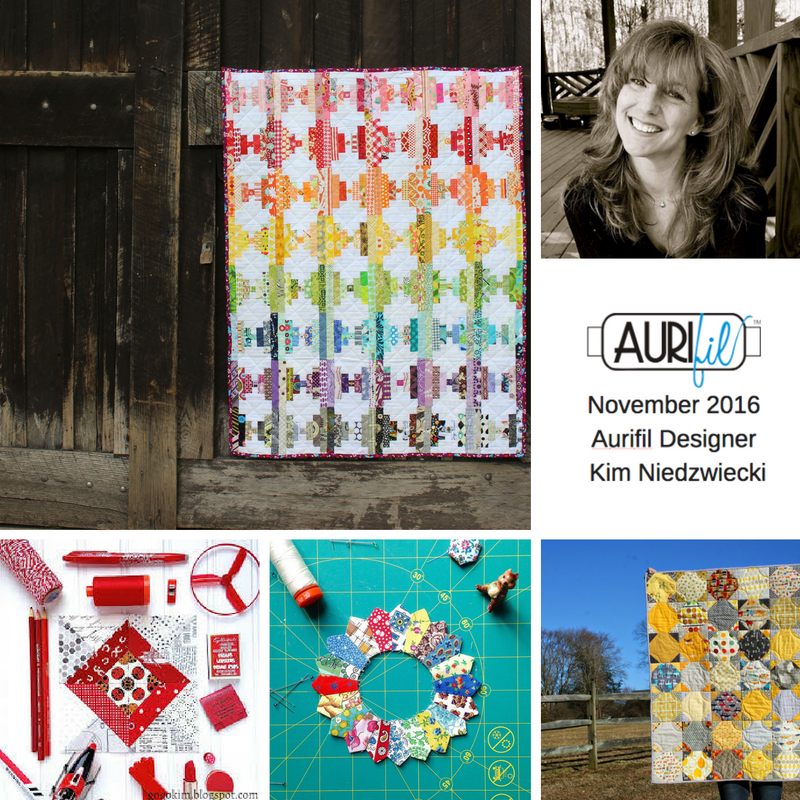 I am over the moon and stars excited to be the Aurifil Designer of the Month for November! My pattern is Geese Feet inspired by the traditional Goose Tracks but better because there are no Y Seams! 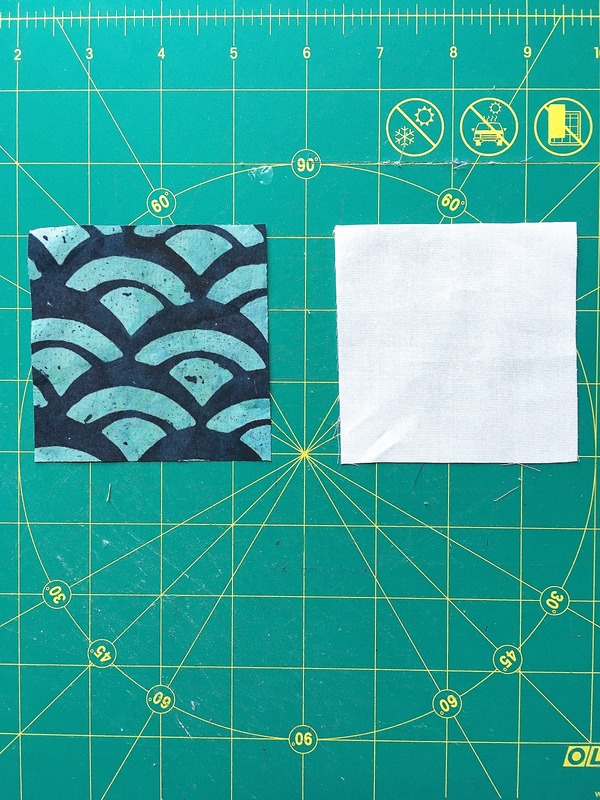 You can get the FREE pattern for this block here. The full year of Designers and their blocks can be found here. 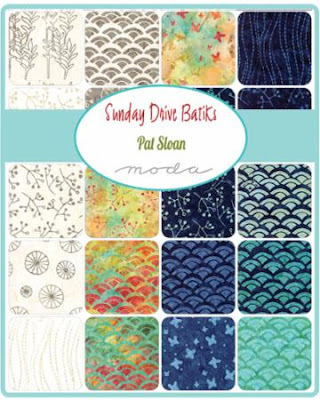 For the blue and white, I used Pat Sloan's gorgeous blue batiks from her new line Sunday Drive for Moda Fabrics and Bella Solids white. 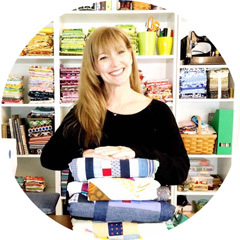 You will want to ask your favorite local quilt shop or online shop about this fantastic collection! 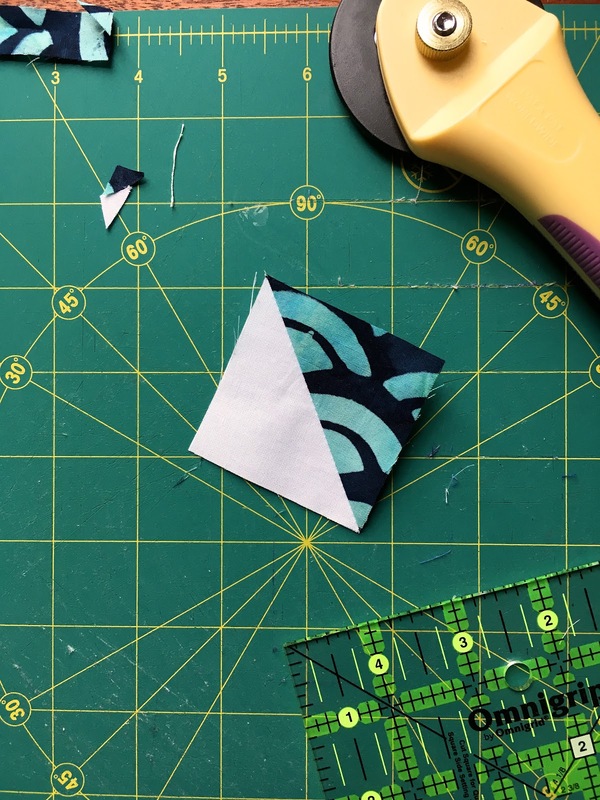 I pieced my block using Aurifil 50wt thread for accuracy and you know it is virtually lint free making it better for your sewing machine! There are two ways to make this block, both are equally as good , it is just what you prefer. 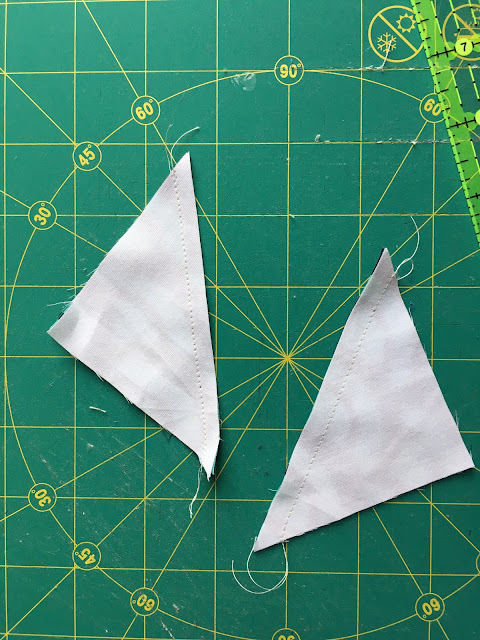 You can make the flying geese as it shows in the pdf pattern or you can also make half square triangles if you do not like to make flying geese. For this block ( in place of the flying geese) you will need to make 16 half square triangles. 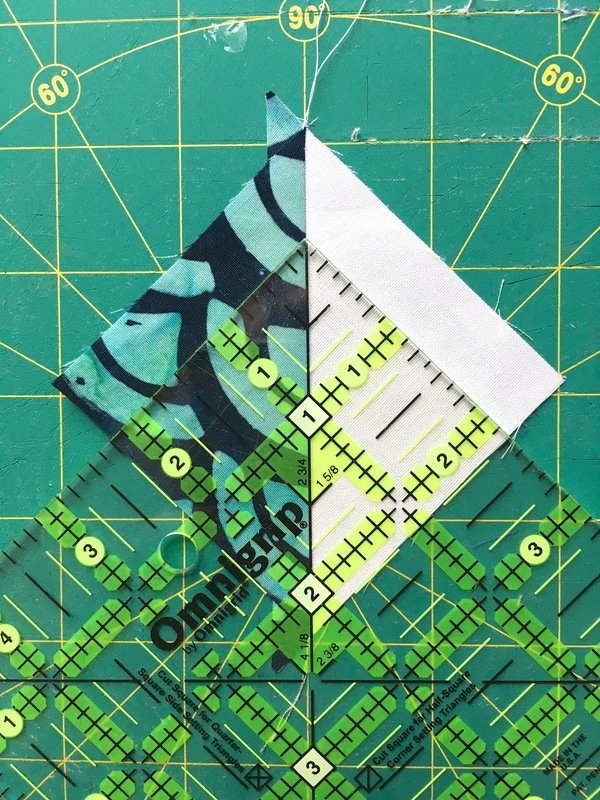 Cut 3 1/4 in squares 16 in the solid ( white) and 16 print. 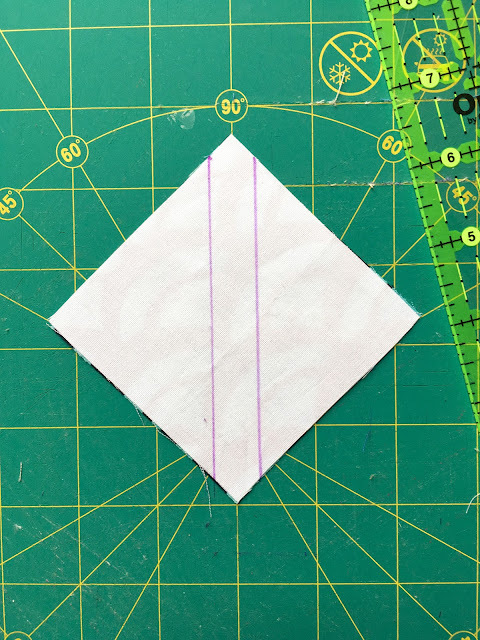 After you have your lines sewn, separate the hst down the center. 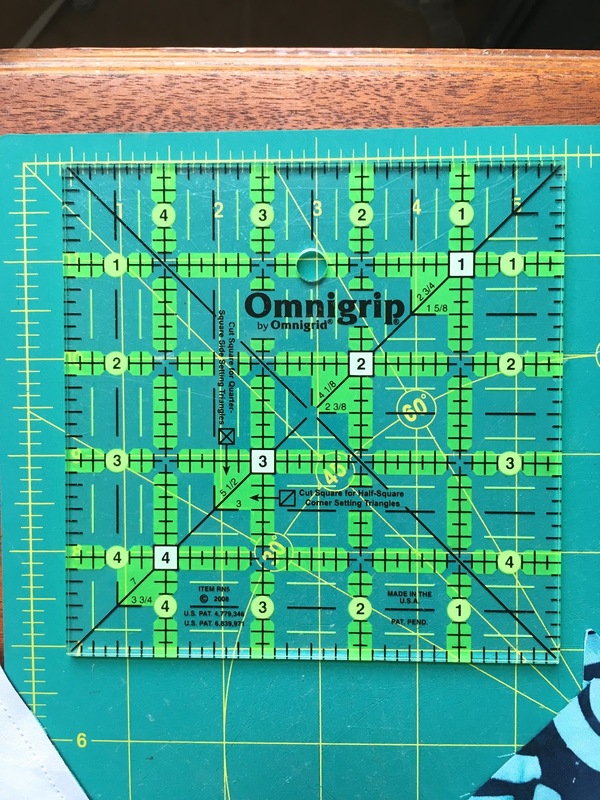 This is one of my all time favorite rulers! It is a must have for every sewing room! You can check your local quilt shop for availability or you can find it here ( this is not an affiliate link, it is just a great ruler). Line up the center of the hst and the edges of the block to the 2 1/4 mark and trim the edges. Trim the dog ear of the opposing side and you have a lovely half square triangle! Here is the placement for the half square triangles for this block. I love having multiple options for blocks! It makes for a wonderful way to either make something easier ( if you are familiar with the technique) or more challenging if it is something new! I really hope you enjoy making this block! thanks for the latest block in the aurifil BOM, I throughly enjoyed reading your interview with Pst and now feel I know more about you and your stitching life, so agree re the tiled floor hate mine in the kitchen so so cold! What a sweet block! It is stunning in the deep blue fabrics against the white ground. Very nice! This is my first time seeing your blog - but it won't be the last. Congratulations on being selected Designer for November!